Trawler Forum - Is 33 Bruce sufficient? Restitution is a 38’ LRC. We are planning on inside passage Cruise this summer. She will have 300’ 5/8 nylon rode and 50’ of 5/16 chain. My plan is using a 33# Bruce. Based upon your differing experiences, will the anchor weight be sufficient for this trip? Check out the Bruce sizing chart at the link below. Looks like you’re in the ballpark for sure. For 18 years I used a 33 Bruce on a 42’ Uniflite. It always set, it always held, every where from Seattle to Ketchikan. I have read maybe a dozen anchor tests over the years. The Bruce always does well, usually at the top in ease of setting. But it is usually at the bottom in holding power. It is easy to see why: The shape and side flukes orient the anchor for easy setting. OTOH, the blunt point doesn't dig deeply and even if it does, the Bruce usually has less fluke area than more modern types. So if you want to use a Bruce, go with a bigger size. IMO 33 lbs is not big enough for your boat. I had a 50 lb Bruce on a 20,000 lb boat. And make sure it is a real Bruce. The Lewmar Claw knockoff somehow does more poorly in anchor tests than the real Bruce. Regardless of the type you choose you will never go wrong going bigger. We sleep well with our 55lb. Rocna on our 20,000lb. 38 footer with half the windage of your boat. We also slept very well on a 38' with a 66lb Bruce & 5/16 all chain rode. Watched others drag in 50-60 kt winds, while we stayed put. Anchors hold till they don't. Especially until you REALLY test them. Some have better reps than others in certain situations, some seem to be pretty much all around solid. Me, 33 in a Bruce would be way too light. I went with a 60lb Manson on my light, 39 foot trawler and feel it's shear weight digs in better than the 33 pound Bruce I had on my last liveaboard, a 37 foot sportfish style. I've got a 33# Lewmar Claw on my 34 LRC (24,000 Lbs loads). TBH, it holds great during regular anchorings the SF Bay and CA Delta mud but it looks woefully undersized sitting on the bow. Even though it's never failed me, even with others hanging on my anchor with me, if I ever have to replace it, I'll go with the 44#/20kg claw. For an inside passage trip, I would prefer all chain. The Bruce and especially other Claws are a little like having a stockless anchor. The Claws don’t penetrate well and stockless anchors wern’t even designed to penetrate the sea floor. If you were to use a Navy anchor you’d probably up-size two to three sizes because there little penetration and small flukes. Hmmm .... kinda like a Claw. The average anchor for my boat is (IMO) about 22lbs. A 33lb Claw would be good for relatively benign weather but maybe not for a serious blow. I would feel safe hang’in on a 44lb though. But a 22lb high performance anchor like a Rocna or a Supreme would be fine. A Claw 1.5 to 2.5 sizes up may match the small HP anchor. IMO a big Claw is great working anchor if it’s big enough. Just like an even bigger stockless would be. So for our original poster going one size up to a 44lb Bruce should be more than a match for most all normal weather. But normal weather in SE Alaska includes gales of about 45 knots. So up-grading to a 44lb Bruce should take care of all but freak weather in SE. But he’s talk’in about pulling by hand so getting a 30lb SARCA would be very good especially with it’s wide range bottom type capabilities. Or a 28lb Supreme for a bit more holding power. But anchoring in strange anchorages a lot the great setting qualities of the SARCA would be my choice. Genuine Bruce or Yum Cha Bruce? FWIW, one of the first things I did after purchasing our 37 Nordic Tug was to replace the 33lb Bruce with a 44lb Rocna. We did OK with Bruces cruising the IP on previous boats, but had a tough time with kelpy or soft mud bottoms. Switched to a slightly bigger Rocna on one boat, and did much better. Set quick and easy, and always held. Seemed like the right thing to do on the NT. If you are pulling by hand, you are probably already maxed out on weight. Your set-up will work fine for a summer. If you have a windlass, going bigger won't hurt anything but your wallet. If you get all the way to SE, we will hopefully be out wandering aimlessly for the summer and are always happy to share an anchorage and swap stories. I missed the 50’ chain, 300’ of rope. I was always all chain. I also double checked the anchors on the old boat. The 33 Bruce was the aft anchor. The bow anchor was a 44. That’s my experience. Many of the Bruce knockoffs were a waste of good metal. Not all but too many. I agree but don’t know of any Claw close to the Bruce. Have a 22lb Claw w no name at all on it. Bought it in Alaska for $85. I’ve since turned it into an experiment .. like so many others. I’ve decided the poor metal, wide throat angle and the thick/fat center fluke are the major negative aspects of the Bruce-offs. Also a shorter shank may be a negative feature also IMO. 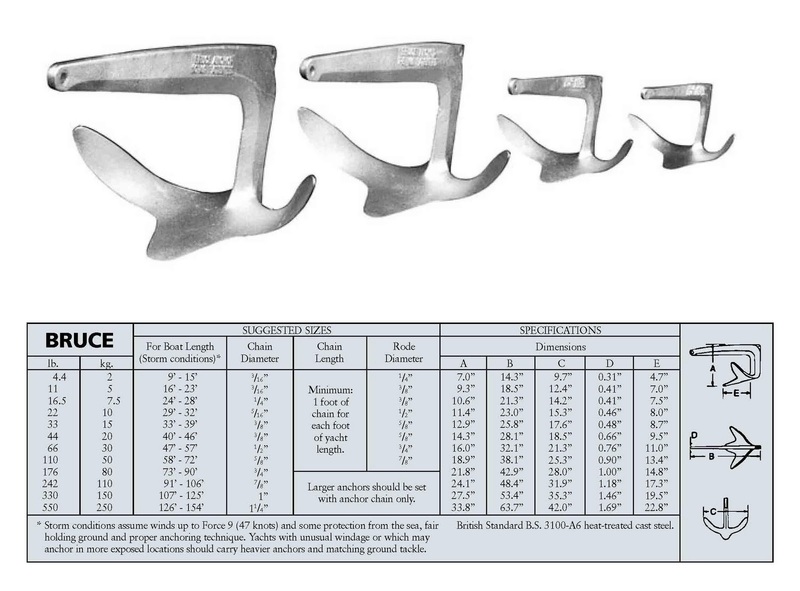 Do you know any galvanized Claw w/o any of the above features?